What is in your sewing basket right now? 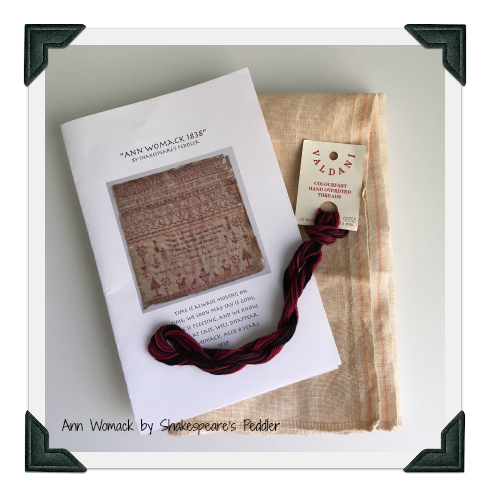 I currently have a number of projects on the go, but the one that is getting all my attention at the moment is Ann Womack from Shakespeare’s Peddler. Several months ago I applied to have a stand at Pakenham Stitch! Having been accepted, I quickly realised that I needed to stitch some new models. And chose Ann Womack. I started working on her using threads and linen from my stash about 6 or 7 weeks ago. Stitched on linen in a single colour, Ann Womack is an easy stitch. Although I have chosen to use threads and fabric from my stash, I will share with you some thread and fabric selections from the store in a week or so. Ann Womack is available on line or at Pakenham Stitch! while stocks last. Over the past few weeks I have been entering more charts on to the website. And I have also ordered new ones for the shop. I am looking forward to their imminent arrival, but really want to finish transferring the existing inventory over to this new website. I am getting there. Tonight, as I was entering the 490th chart, I was attracted to the sweet sounding Springtime Serenade by Country Cottage Needleworks. With Melbourne being in the cold, wet depths of winter, I am looking forward to Spring, as I am really a summer person.